After the only rest day, GM Sergey Shipov was back commentating live on Rd 6 of the Sparkassen Chess-Meeting in Dortmund. Le Quang Liem had the white pieces against Vladimir Kramnik, and the Vietnamese player unleashed a powerful novelty. 1. d4 d5 2. Nf3 Nf6 3. c4 e6 4. g3 The Catalan. Who had any doubts! If it’s the opening where black has some problems then it would be foolish not to take advantage! While current grandmasters are no match for former grandmasters at sticking to openings. They switch from one opening to another very quickly. With the computer as an assistant they can very quickly adopt what is for them a completely new opening. 4…Be7 A calm solid line. 5. Bg2 0-0 6. 0-0 dxc4 7. Qc2 Black’s extra pawn can’t be held for long. 8. Qxc4 b5 9. Qc2 Bb7 The activity of white’s queen allowed black to develop the queenside. He’s just got one small problem remaining – the backwards pawn on c7. 10. Bd2 Kramnik’s light touch has made this the most popular move of the new century. The bishop is aiming for a5. 10…Be4 11. Qc1 Bb7 Black isn’t rushing to bring the queen’s knight to d5. In that case the white bishop coming to a5 is really dangerous. While for now, on the other hand, it’s premature on account of Nb8-c6! 12…Nd5 13. Nc3 The bishop did what it had to do, so now it can go. 13…Nxf4 14. Qxf4 White has almost completed his development. While that’s still ahead, for black. 14…Qd6 A solid, reliable move. 15. 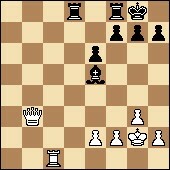 Ne5 The simplest means of depriving his opponent of the advantage of the two bishops. And this is the great thing about the queen on d6. It’s keeping an eye on the c6 square, which allows black to develop the queen’s knight. 17. Rac1 But white once more prevents the c7-c5 break. Looking in my database, it’s a novelty! Judging by the speed it was carried out it was prepared at home. As it should be. Home novelties, as a rule, are much higher quality than those invented at the board. 17…Nxe5 18. dxe5 The exchange of queens would, of course, be harmless. 18…Qb6 So, black has prepared the c7-c5 advance. It can’t be stopped. 19. Ne4 But this is the idea. White isn’t only looking at the d6 point (in case of c7-c5), but also preparing mating combinations. Every move now you have to keep in mind the white knight getting to f6. Vladimir has sunk into thought. The clocks show: 1.43 – 1.30. In broad brush strokes: a little-known Vietnamese guy has sprung a serious surprise on the best expert in the Catalan, the ex-World Champion Kramnik! White isn’t intending to give up such an important file, although black hadn’t yet threatened to invade there. The first thing that needs to be looked at here is the exchange of all four rooks after 20…Rxd1 21 Rxd1 Rd8… No. It doesn’t work! After 22. Rxd8+ Bxd8 23. Qd2! the white queen invades on d7, which is extremely dangerous for black. And what else can be done? If you play passively then black can expect the procession h2-h4-h5-h6. Believe me, it’s no trifle. 20…c5 Logical. There’s no point in always keeping your aces up your sleeve. 21. Nd6 Played just as decisively and quickly. It’s clear that we’re still within the home analysis. After the move played it’s very difficult for black to deal with the white outpost on d6. On 21…f6 the cunning Le has no doubt prepared 22. Qg4! 21…c4 A natural move, but it allows white to open the c file by means of 22. b3!? I suspect that this is the first time that the Vietnamese grandmaster has glanced at the position with interest. 22…cxb3 After 17 minutes Vladimir took the simplest and most obvious path. 23. axb3 A working file is opened. White’s plans include putting a rook on c6 after, for instance, Qf4-e4. This potentially weak pawn is striving to become a passed pawn. Now on every move you have to keep an eye on the a5-a4 exchanging operation. 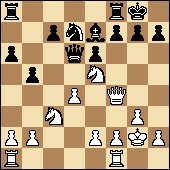 By the way, at some point black can simply dismiss the knight on d6 with contempt and play Rd8-a8. If it’s possible to advance the rook pawn further, then white can’t attack in total comfort. Now white has a veeeery wide choice. But the most practical option, in my opinion, is the universal continuation 24. Qe4. After the rook gets to the sixth rank white can deal with the enemy pawns on the queenside. They need to be taken while not losing the one on d6. There are chances, and serious chances, as black’s rook on f8 is doing nothing. While all white’s fighters are in the field. 24. Rd3 Also a good, flexible move, with many plans. Le is preparing to double rooks… for now it’s not clear on which file. In passing he’s preparing a barrier for the black passed pawn on a3. Another resource he’ll have is putting pressure on f7 after Rd3-f3. 24…a4! As the time remaining is two-to-one (1.20 – 0.40), Kramnik doesn’t want to continue tricky play with lots of complex branches. In that case you’ll end up in heavy time trouble! So he’s going for simplifications. 25. bxa4 bxa4 Agreeing to give up material… But by no means just a pawn! 26. Qxa4 Bxd6 27. Rb3 Here’s the point. The black queen is lost. But not for nothing! To sum up the complications: Kramnik got off easy! On just one flank white’s material advantage isn’t felt. Black’s chances of a draw are very close to 100% Pay no attention to the extreme optimism of the computer programs that are convinced white has a large advantage. They don’t understand a thing! It seems that it was in vain that the Vietnamese grandmaster rejected 24. Qe4! The time difference is no longer relevant: 1.12 – 0.37. In such extremely simple positions you can play quickly and safely. 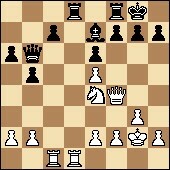 29. h4 A pawn storm – there are no other chances to win. 29…g6 The pawns control the white squares, the bishop works on the black. Perfect harmony. 30. h5 Creating a flash-point. If you allowed h7-h5 (which until the black pawn appeared on g6 wasn’t possible because of Rc1-c5! ), then the chances for active play for white would have been sharply reduced. 30…Bg7 31. Rc5 A manoeuvre which is by no means strange. 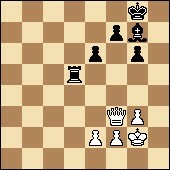 Black threatened Rd8-d5! simplifying the pawn structure. While now white can still play on a bit with the potentially dangerous pawn on h5. 31…Rd7 Time to activate the sleeping rook on f8. 32. Rb5 Rfd8 If you asked me now, what’s white’s plan, I’d find myself in a spot of bother. The position’s crying out for some more pawn aggression. But what would that give except more exchanges? And the white king won’t feel so comfortable. In any case, while black still has two rooks you can’t underestimate that factor. Someone suggests advancing the pawn to h6 by putting the queen on e3? Well, black moves the bishop back to f8. And then what? 33. Qf3 Le isn’t preventing the black rook from getting to d5. It seems that he doesn’t believe he has any real chances to win. Now there are no resources left to fight with. Well, a fair result. 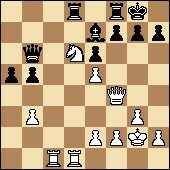 Le used a very interesting opening novelty, got an advantage and developed serious pressure. And then Kramnik showed that he has what distinguishes elite grandmasters from common mortals. They’re very strong in defence! And they can use any chance to save themselves, even a barely noticeable one. Working for you, dear spectators, has been Grandmaster Sergey Shipov. All the best, and see you tomorrow!